Amir Khan: will he finally walk the walk? Returning from the 2004 Olympic games in Athens was a 17 year old boxer from Bolton, whose performances there belied his juvenility and gained him the adoration of a nation. Amir ‘King’ Khan’s star could not be higher back in his home country and, after defeating the man who defeated him in the Olympic final, the professional ranks beckoned with a huge amount of potential being seen in this likable young star. Ten years later and that adoration and faith seems to have faded in the wash slightly. Prior to his impressive victory over his best opponent since his complete capitulation against Danny Garcia, Khan had been busy lobbying quite desperately for a bout with the undefeated phenomenon Floyd ‘Money’ Mayweather, only for his pleas to fall on deaf ears. Opinion seemed to be split on the subject, however, as many pundits believe that he has the tools to truly give Floyd a test that he most definitely has not been given in a while. The fans, meanwhile, seemed to incessantly question what it is exactly Khan has done to deserve such a coveted opportunity. I wanted to examine why Khan’s credibility is so low right now, but also whether he genuinely has the weaponry to at least threaten Mayweather’s seemingly impregnable fortress. Watching Amir’s early professional fights, it is not hard to see why he was embraced by the public. In those destructive performances, where obviously the opponents were at a low standard as is the case with most boxers, demonstrated an ability to thoroughly confuse and simultaneously hurt his opponents with pure speed. His combinations were breath-taking at times as he landed anywhere between 3 and 10 punches all over his opponent before slipping away and negating the chance for a reply to be sent. Add this to his obvious athleticism and good movement around the ring and you have a fighter who is as hard to catch as his punches are to stop. Yet, even in his early ‘practice’ fights if you like, Khan displayed a propensity for being caught. His chin was rarely tested against those fighters, but it acted as a forewarning of what was to come later on. The British boxing pundits consistently questioned Khan’s defence; in particular his insistence on walking in with his hands low and his capacity to be drawn in to a brawl, but as long as Khan kept knocking over his inferior challengers nothing was set to change. On the 6th September 2008 Amir Khan was due to outclass yet another supposedly sub-standard opponent in the form of the beastly Breidis Prescott. They were both undefeated at that point, yet Khan was the odds-on favourite to win despite Prescott’s size and intimidating knockout ratio which was 17 in his 19 contests leading up to facing Amir. What unfolded was one of the biggest upsets in recent memory, and the ultimate exposure of Khan’s defensive frailties. Nothing out of the ordinary at the beginning as Khan met Prescott in the middle and the pair exchanged tentative jabs, until Khan over-reached. Just 11 seconds in to the bout, Khan went for an ambitious uppercut that missed the target, but as he was swinging he was caught with a huge right hook that left his legs resembling spaghetti. Two more earth-shattering hooks and ‘King’ Khan was on the canvas with a look on his face that suggested he was not sure what continent he was on. He valiantly rose to his feet and attempted to fight on, but rather than trying to stabilize his foundations and use his superior speed to avoid Prescott’s deadly swings, Khan attempted to level the score, and 3 plush hooks later he was on the deck again. His balance had completely deserted him and the referee rightly ended the fight after just 54 seconds. This was a monumental defeat for Khan that threatened to destroy his popularity. This caused Khan to dispense with his coach for that fight, Jorge Rubio, to join Freddie Roach’s widely-acclaimed Wild Card Gym. The move saw significant improvement for Khan, but the question marks still remained over his chin and his defensive abilities; as Roach prefers his fighters to concentrate on offense. Notable wins over veterans ‘The Baby-faced Assassin’ Marco Antonio Barrera and the older but still highly-rated Zab Judah, as well as a victory against Paulie Malignaggi, had seemingly put Khan on the fast track to the top. In one of his most impressive performances Khan took on Mayweather’s latest victim, Marcos Maidana, who at the time had won 27 of his 29 wins by knockout and had only been defeated once. Maidana is recognized as one of the bigger punchers in the division and also has a distinct ‘brawler’ style that sees him apply constant pressure to his opponent by stalking them down and hitting them hard. This was seen as a huge risk for Khan due to many in the media describing him as ‘chinny’; as he catches a lot of punches in his fights, and the Breidis Prescott fight was invariably referenced. Despite this, Khan thoroughly impressed me in his performance. He knocked down the ultra-durable Maidana in just the 1st round with a visceral flurry of body punches and went on to more-or-less dominate the fight with his slick movement and accurate shots. Maidana found it hard to pin Khan down in the early rounds as the British boxer danced around the ring and countered with quick and powerful punches. The doubts were raised again when Khan was caught with a hook from the hip in the 10th, yet he rallied and managed to survive the onslaught that followed. Both boxers took shots in this bout that would have felled many a worthy challenger in the division, which was one of the factors that contributed to the match being billed as Fight of the Year by the Boxing Writers Association of America. Although Maidana did land quite a large quantity of his punches, Khan only looked troubled in the 10th round, and walked through some of Maidana’s most powerful punches in the earlier rounds. This led his fans to begin to believe again, right up until their beloved Amir met Danny Garcia. After what can only be described as a controversial defeat to Lamont Peterson, in which he begrudgingly relinquished his WBA and IBF belts, Khan was due to meet the highly-rated and unbeaten Puerto Rican-American Danny Garcia. The WBC belt would be on the line that night, but the biggest prize on offer for Khan was the opportunity to bounce straight back from a loss that not many viewers would argue was deserved. The build-up was as intense as it was entertaining, with both teams, and fathers, of the boxers completely dismissing the other’s chances of being victorious. 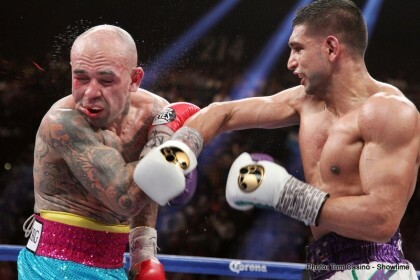 Amir Khan’s mouth had set him up for the fall of his career, as his complete and utter lack of care led him to repeatedly leave his right side vulnerable to Garcia’s already famous left hook. Warning signs were there in the first 2 rounds, before Khan ultimately paid the price for over-committing as he saw two poorly timed hooks miss in the 3rd. Something that Khan undisputedly did not see, however, was Danny Garcia’s left hand flying in to the unguarded right hand side of his face. The punch was devastating and its’ effects were immediately visible. READ Crawford vs. Khan RESULTS: Do P4P low blows hurt? In typical Khan fashion he attempted to save face by engaging and he barely made it through the round. A break of an hour would still not have been enough, so after the 60 seconds in his corner were up it was no surprise to see him felled twice more in the 4th and final round. The fight was, for me, by far the most frustrating Amir Khan performance to date. He had control of the first two rounds, even if his punches did not seem to have any effect on Garcia, but his over-riding desire to be the toughest, most powerful man led him to jump in to combinations that were messy and unnecessary. Once again his mentality had orchestrated his downfall. Some of the punches I have seen Khan completely walk through make it hard to state outright that his chin is the problem. As I see it, his problem is that he does not see the shots coming as he focuses on trying to cause his adversary pain. If Amir Khan erased this flaw from his mentality his un-teachable speed and slick boxing skills would most probably have seen him through the Garcia bout, and made some of his more laboured victories much easier to secure. Once again, the coach was the scapegoat. Freddie Roach’s services were no longer required and Khan joined up with the coach many of the critics felt was best for him, Virgil Hunter. Hunter trained the undefeated and thoroughly avoided Andre Ward, whose style is focussed mainly on his dazzling defence. His first fight with Virgil in his corner came against the unbeaten but little-fancied Carlos Molina; who Khan dispensed with in the 10th round thanks to a technical knockout. Next was Julio Diaz, another opponent who many felt Khan should be putting away easily in search of a better-known opponent. It was not meant to be, and after surviving a heavy 4th round knockdown, Khan scraped a unanimous decision and failed to properly silence his growing number of critics. Despite Hunter’s influence, Khan was still hit with a lot more punches than many of the division’s top contenders would have taken. It was another underwhelming performance, underpinned by a feeling that Khan could do much better. He appears at times like a boxer caught in the middle. He has all the technical and athletic skills to be an exceptional boxer who would be happier with a dominating points victory than with a one-punch knockout. The red-mist often descends, however, and Khan wades in, drops his hands, and takes little care to pick his shots carefully, instead trying to incapacitate the man opposite him with the sort of power that he simply does not possess. If Khan stuck to that age-old adage of punching and moving, instead of allowing himself to be dragged in to wars that hugely favour his competitors, it is hard to see how Prescott and Garcia would have managed to beat him. It would also have enabled him to completely embarrass the far less refined Julio Diaz. Although his chin had improved, the ease with which it can be reached just had not been dealt with. After galling cancellations wrecking his chances of facing Devon Alexander, Khan came back to the forefront of the boxing world again after his name was ‘considered’ for a money-spinning fight with boxing’s current biggest star, Floyd Mayweather. Amir and his team had the propaganda factory producing 24 hours a day as he tirelessly tried to force the issue, only for Mayweather to pick the arguably more-deserving, Marcos Maidana. Khan lamented this decision, and claimed he deserved the chance to topple Money more than Maidana, who himself had just beaten the brash but talented Adrien ‘The Problem’ Broner. I believe Amir’s insistences have only served to alienate him more from the general boxing public. With almost weekly interviews criticising Mayweather’s decision, stating he was stronger at welterweight, and incessantly reminding us that he was ‘back’, all it has done is destroy his image as an approachable, honest sportsman. Even the biggest Amir Khan fan would have a job arguing that after more than a year of inactivity and nobody mentioning a potential match-up before, he was suddenly entitled to his biggest ever payday and a fight that would be watched by millions. Maidana reacted fantastically after his defeat to Khan and has only been beaten since then by Devon Alexander and Floyd Mayweather, hardly Breidis Prescott and Danny Garcia. After impressing on his 147lb. debut against an aging but undoubtedly dangerous; as proven in his last fight before Khan when he felled faded star Victor Ortiz, Khan believes he holds the superior cards in the poker match that will ensue between himself and Mayweather. Amir will continue to publicly push for the bout, whilst Mayweather will likely continue to dismiss it. It has been widely predicted that if the Khan who beat Collazo was to face off with TBE; Mayweather’s latest self-proclaimed moniker standing for ‘The Best Ever’, he would trouble the future Hall-of-Famer far more than the last few doomed competitors. His speed, slick movement and quick reflexes are all attributes that pundits around the world believe the 37-year old Floyd would seriously struggle with. Yet whilst this may be true, the real question that needs to be answered is whether he truly deserves it. Despite Khan’s proclamations regarding his new found strength and his overall condition at his new weight, it is hard to argue that his last 5 fights are enough to dispel the anxieties still held by many about his temperament and his chin. Nevertheless, he will campaign, and we will have to wait and see as to whether or not it pays off; quite literally. You are here: Home / Boxing News / Amir Khan: will he finally walk the walk?